Marked by growing freedom and equality, today's families are also dogged by brokenness and loss of faith. And while the theology of marriage has developed remarkably under the impetus of the Second Vatican Council and Pope John Paul II, the theology of the family remains in its infancy, only beginning to meet the challenges of contemporary society.In "Divine Likeness" Marc Cardinal Ouellet points the way to a much-needed theology of the family grounded in the doctrine of the Trinity. Cardinal Ouellet understands family life to be a sacrament of Trinitarian communion, a crucial source for revealing and inspiring a new sense of God's presence in the faith community. This book will help theologians, pastors, and believers to develop fruitfully the legacy of Pope John Paul II, carrying forward the quest to let the Trinity and the family illuminate each other for the good of today's world. - Publisher Marked by growing freedom and equality, today's families are also dogged by brokenness and loss of faith. And while the theology of marriage has developed remarkably under the impetus of the Second Vatican Council and Pope John Paul II, the theology of the family remains in its infancy, only beginning to meet the challenges of contemporary society. 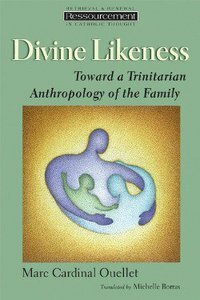 About "Divine Likeness (Ressourcement: Retrieval And Renewal In Catholic Thought Series)"
Marked by growing freedom and equality, today's families are also dogged by brokenness and loss of faith. And while the theology of marriage has developed remarkably under the impetus of the Second Vatican Council and Pope John Paul II, the theology of the family remains in its infancy, only beginning to meet the challenges of contemporary society. Marc Cardinal Ouellet is Archbishop of Quibec and Primate of Canada. He held the chair of dogmatic theology at the Pontifical John Paul II Institute for Studies on Marriage and Family in Rome from 1996 to 2002 and previously taught theology in Columbia and Canada.